Love working with kids? Why not make a difference this summer! Double H Ranch is a summer camp that offers children dealing with critical or life-threatening illnesses the chance to experience the magic of the Adirondacks. We spoke with past counselors Fiona Shae and Brendan Kelley to learn more about their rewarding experience as Camp Counselors. Help Kids with Serious Illnesses have Limitless Fun! 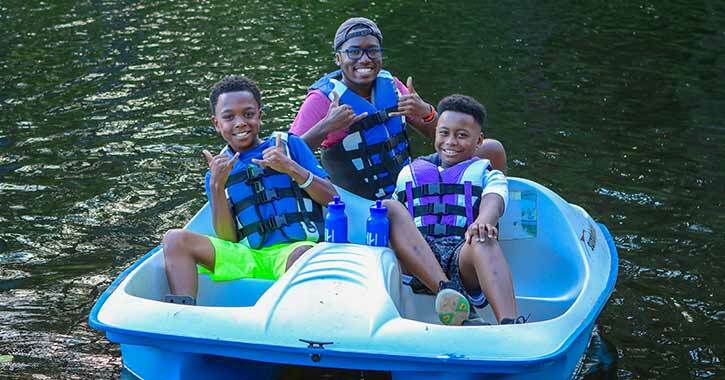 From June to August, during Double H Ranch's eight summer residential camp sessions, the camp is filled with the sounds of laughter and the joys of childhood. Counselors are an integral part of a camper's experience and help provide fun and empowering camp experiences for all. Former counselor Fiona Shae explains that Double H allows you to work with kids that are not typically allowed to attend other summer camps. Why? "...because of the limitations that people think [the campers] have, and for us, they're not limitations, they're challenges that we want to help them get through. 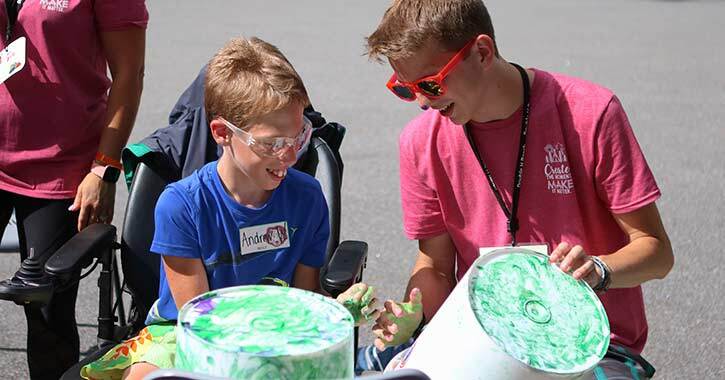 You don't normally see kids in wheelchairs being able to ride boats or go on...obstacle courses and that's a thing that camp can provide every week for these kids." Double H Ranch allows all of its campers to go through their obstacle courses, swim, horseback ride, and do a number of wonderfully fun activities they're not typically able to do outside of camp. At Double H, they make it their mission to make activities accessible for all campers. Be a Role Model, Watchful Eye, and Fun Superhero! Each session lasts 6 days and accommodates approximately 126 campers with a close camper to staff ratio of 2:1. An onsite medical facility is staffed 24 hours a day with doctors and nurses for medical care, but it's the counselors that attend to the camper's day-to-day needs. Camp Counselors live in the cabin with campers and are the campers' go-to crew, providing personal care including bathing, toileting, grooming, and dressing, transporting them to daily activities, and creating a sunny, warm environment for campers to thrive. "The biggest thing counselors do is give love and give comfort," says Fiona. "We're lucky enough to be one of the Serious Fun organizations who can allow that for a kid, so we definitely make sure that we can give them the most hugs and most smiles. That's our biggest goal." Founded by Paul Newman in 1988, Serious Fun camps provide children living with serious illnesses a spectacular camp experience and high-quality medical care. Double H Ranch is one of the thirty life-changing camps in this organization. Former camp counselor Brendan Kelley explains how central the counselor's role is to ensuring each camper enjoys their experience. "The other really key job of the counselors is being perceptive of how the campers are doing," says Brendan. "The nurses and the doctors are there for help, but it's the counselors that are the people who actually can see each camper day-to-day, and monitor how they're doing. If something changes in their mood, or in their disposition." Spread the Magical Joy of Adirondack Camp Life! Counselors receive a weeklong training session before camp starts to learn about the different diagnoses they may encounter and how to care for them, in addition to prep before the start of each session to learn about the campers they're responsible for. "The training was great especially because the people who are doing the training have been at camp for so long," says Brendan. "They have so much experience with some of the difficulties that you're going to see, that it's really cool how they can preempt some of the situations that you're going to come across." Counselors also receive training on making activities accessible for all campers so everyone can enjoy and experience the magic of camp life. "We go through training on getting kiddos on horses, on boats, on obstacle courses... It's really our job to know how to do those things, and people think it's difficult, but the thing is you have eighty other people surrounding you who want to help and who want to be there with you and help that kid, so you're never alone," says Fiona. Don't Be Afraid to Put on a Costume or Get Messy! Counselors are the coordinators of fun at camp. You'll often find a counselor making jokes, sporting costumes, or playing back pocket games to brighten up a camper's mood. Counselors have also been known to sit under dunk tanks and get hit with paint-filled balloons! 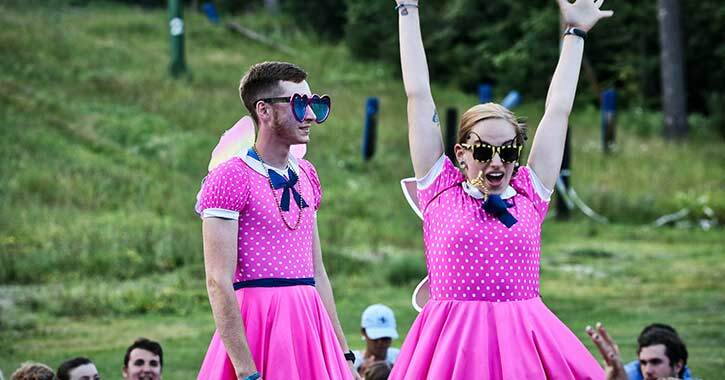 At Double H Ranch, all counselors are united under one goal: make sure each camper has fun! 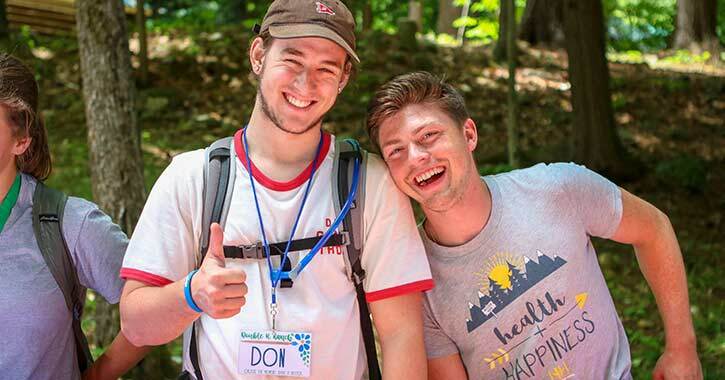 "I would say that one of the things that was really important for me about camp that I took away was that it showed me what an ideal work environment can be," says Brendan. "It showed me how enjoyable it could be to work in an environment where everybody is in 100%, and everyone is trying their best. I think that makes camp a great place for anybody, no matter if it directly relates to something they want to do in the future or not. You don't have to want to be a doctor, a physical therapist, or anything like that to be a counselor. I think that it's beneficial for anybody." Apply to be a Camp Counselor Today! Both Fiona and Brendan are eager to become Camp Counselors again and encourage all who are curious to apply. Don't know if you'd make a good fit? Here's some advice from Fiona: "Don't be worried that you're not going to know anything or that it's going to be too much information! Because you receive training within the first week and there's always going to be veteran counselors around that are going to help you through it. It's going to be completely eye opening and it's going to be a little scary. But that's okay, because you have to be scared sometimes to do your best work. You have to be a little unprepared to see how well you're going to do, so I definitely think you've got to go for it. You've got to click the button, you can't really hesitate." 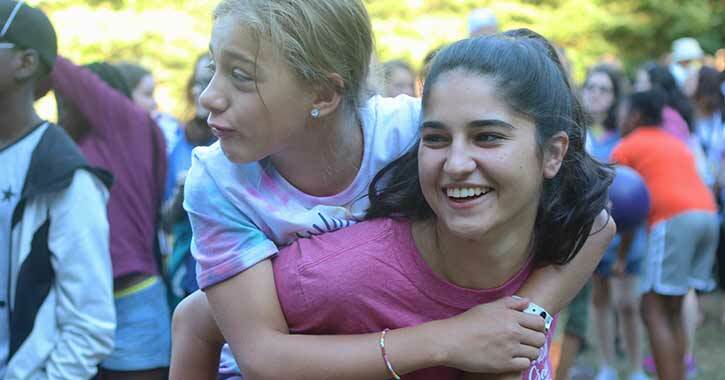 In order to apply, Camp Counselors must be 19 years of age or 18 with at least one year of college, and Counselors-In-Training (CITs) can be 17 years of age. Learn more about becoming a Camp Counselor today!